Don't let occasional allergies, food-related ills and seasonal aliments take the pep out of your pooch. Sometimes Fido needs a little Boosto. Every Immuno Boosto stick pack is bursting with 20 billion CFUs of 11 funk-fighting strains of probiotics, plus proprietary blend of 8 mushrooms, 8 herbs, and 4 vitamins, and essential minerals. Just sprinkle the paw-lickin'-delicious Chicken Noodle-flavored powder over Fido's food to give his immune system a well-deserved lift. Ingredients: A proprietary Boosto Probiotic Blend of (Lactobacillus acidophilus, Bifidobacterium lactic/B. animals, B. longum, B. infantis, L. casei, L. gassari, L. rhamnosus, B. bifidum, L. salivarius, L. paracasei, L. planetarium) 139 mg A Proprietary Boosto Mushroom Blend of (Cordyceps, Agaricus blazei, Maitake, Reishi, Shiitake, Turkey tail, Pleurotus eryngii, Hericium erinaceus) 1,519 mg A Proprietary Boosto Herbs, Vitamins, and Mineral Blend of (Calcium Ascorbate (Vitamin C), Astragalus, Ashwagandha, Turmeric, Siberian Ginseng, Ginger, Zinc Citrate, Echinacea, Alpha Tocopheryl Acetate (Vitamin E), Rhodiola,Beta Carotene, Astaxanthin) 636 mg. Inactive Ingredients: Chicken noodle flavor, Coconut oil, Inulin, Pumpkin. 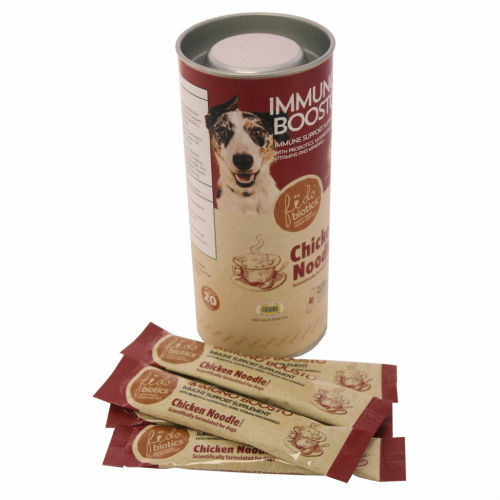 Product Facts: Recommended for dogs with occasional allergies, food-related ills, and weakened immune systems. Great for dogs that have frequent antibiotic treatments and vaccinations.